There is nothing like adding fruit to a cocktail. But when you add fruit to a margarita, you get something magical. 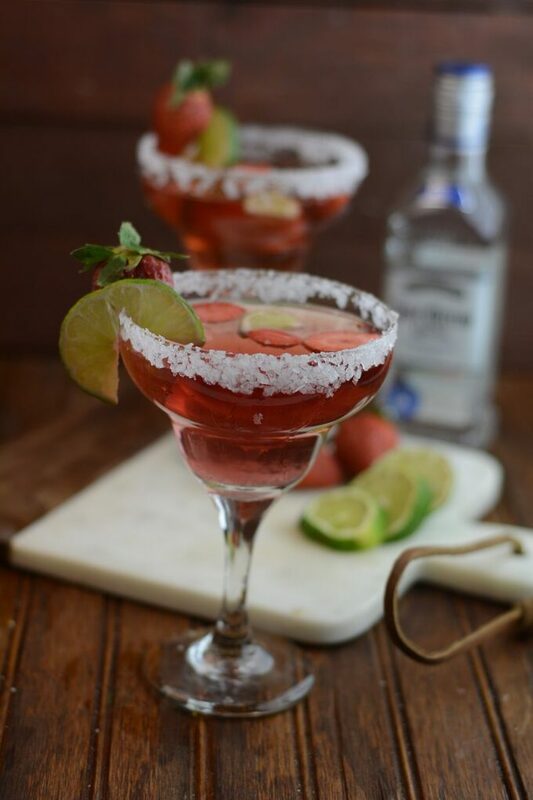 One of the best fruits to add to a margarita is a strawberry; there is something about the sweetness that takes the alcoholic beverage to the next level. You don’t even have to add alcohol to make this cocktail a tasty treat for both parents and children alike. 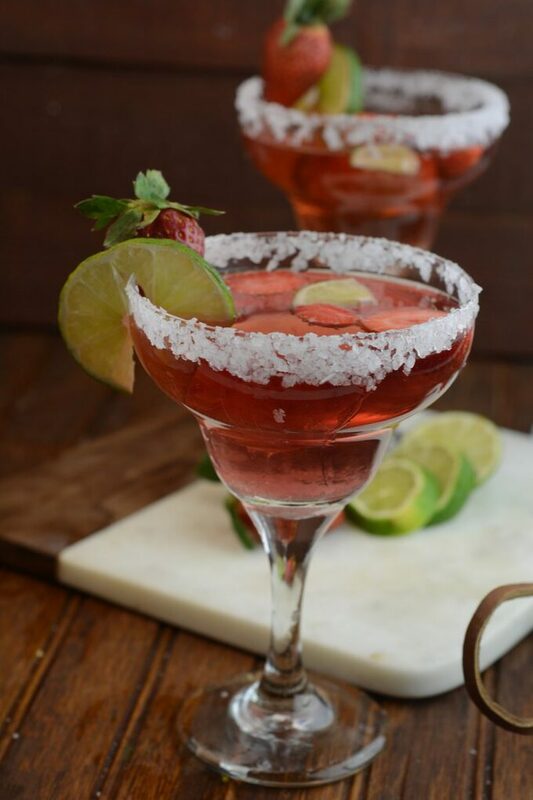 A strawberry margarita recipe made with a bit of strawberry puree takes this fruity margarita to the next level. 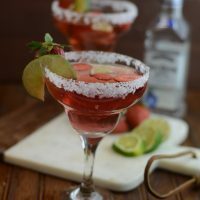 A strawberry margarita recipe that is simple and easy to make is perfect for an evening cocktail or when entertaining especially during summer! One of the things I love most about this strawberry margarita is that it is super easy to make and makes four servings at a time! Perfect for parties and holiday gatherings! If you plan on serving this cocktail or others you can’t go wrong with some basic supplies. A variety of glasses for margaritas, cocktails, mojitos, and of course some wine glasses. I also like to keep some basic bar necessities on hand like a shaker, muddler, cutting boards, knives, shot glasses, measuring tools, and a serving tray! Tequila, margarita mix, and salt are what you often get on the ingredients list of a margarita. However, this margarita isn’t like other margaritas. Instead of a mix, you will be making this from scratch so you will need a strawberry puree, limes, some triple sec and some strawberries. Altogether, these ingredients make one of the freshest tasting cocktails you’ve ever had. 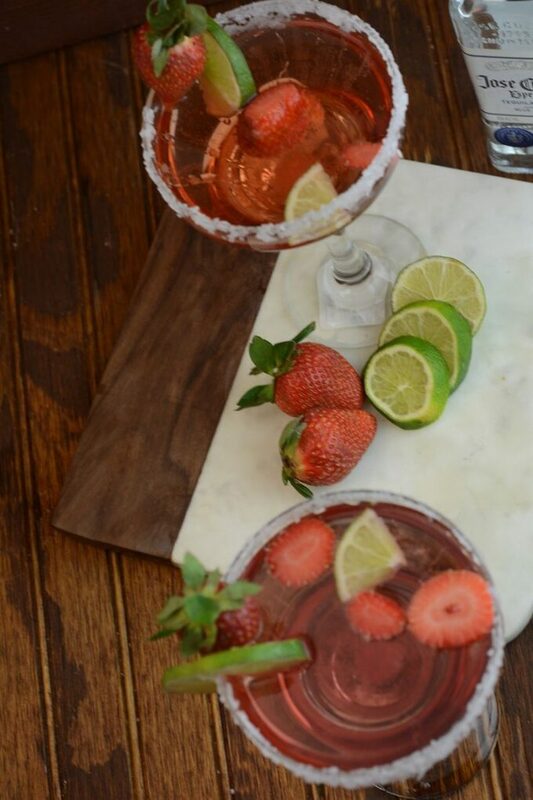 To make this delicious strawberry margarita recipe, follow these instructions. Mix together Strawberry Puree and juice from two limes. Stir Tequila in and pour over ice. Add a splash of triple sec. Add sliced strawberries to the float atop the margarita. Optional: Line rims of glasses with Salt. This strawberry margarita recipe makes four eight-ounce servings! If you are entertaining, I definitely recommend serving in a white or clear pitcher because this margarita displays beautifully! This delicious margarita is featured in my Summer Cocktail Recipes eBook! It’s among all sorts of other delicious light and refreshing cocktails! My husband and I love happy hour; if this margarita is not your style maybe our Nearly NorCal Margarita is a better fit. We have plenty of other cocktail recipes to choose from as well.